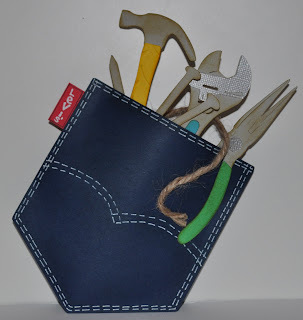 That is a handy man gift card holder. The Father's Day card I made has a handyman theme. I've die cut blue jean fabric in the shape of a pocket before. este yo creo que realmente es el proyecto favorito de padres que yo he visto. This is so awesome! Those tools look so real. I not even convinced that they are not. Such a cute idea. Love the pocket idea. It took me three super close looks to figure out that those tools weren't real! Wow. You are super talented! How did you get them to look so authentic? Hi, Roberta. My name is Jen and I too am a procrastinator!!! LOL! Love, love, LOVE this project. It is sheer awesomeness! OMG... this is too COOL! I love the pocket stuffed with ALL the tools! What a fantastic idea and so clever too. Any man would LOVE this card!